Image courtesy of Nicelle Beauchene Gallery. 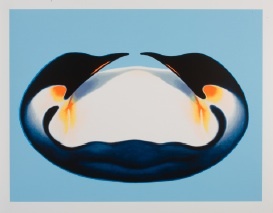 "Penguin Paradox" (2010). Brock Enright. 13 color Silkscreen on 350 gsm Coventry Rag. 24 in x 18 in. Edition 75. Acquiring limited edition artwork as a means of collecting works by more established artists at lower price points than unique pieces is not a new phenomenon. Commissioning established artists to create limited editions specifically for that client base - and then making them available exclusively online, however, is a novel and burgeoning trend. This week, collectors can acquire limited edition artworks by major artists at 20x200, a website offering a selection of limited edition artwork at affordable prices, and Gilt Groupe, an invitation-only website that sells luxury brands and products at a discount. On this past Wednesday, April 28, 20x200 released a print by the prominent Conceptual artist Lawrence Weiner created specifically for the site as recently announced on art journalist Lindsay Pollock's blog. Available in four sizes with different edition sizes, the print is priced from $50 to $5,000 and is selling out quickly. Unlike the 20x200 sale which will offer the Weiner print until the edition sells out, the Enright print will only be available for a few days on the Gilt website. As we continue to expand the Gilt Home offering, art is emerging as a key category. Our members are very interested in discovering emerging artists and through our partnership with Art & Advisory we are making it easier for them to engage in a dialog about contemporary art. We are looking forward to presenting Brock Enright's work to Gilt members. The sites are founded on different principles, but result in a common outcome. 20x200 aims to make affordable art available to a wider audience and Gilt offers discounted luxury goods to a broader market. They have simultaneously led the trend of commissioning artworks by established artists and offering them for affordable or discounted prices exclusively online. As an advisor with a number of young (and new) collectors, these types of thoughtful collaborations where an online venture commissions an established artist provide an entry-point into what is often perceived of as an inaccessible and difficult-to-navigate art world. Not everyone is Dakis Jouannou - with an unlimited budget and art advisors on retainer - so we wanted to provide outstanding interesting work to novice art enthusiasts. Working with Gilt, which is in itself curated for its members and insists on integrity and quality, seemed a great way to do this efficiently. Brock has such a cult following - some of the most famous artists working today buy his work - and we wanted to introduce and share his genius. For the sale, Gilt asked us to provide their members with lots of information and context - so we hope they get a highly filtered, curated introduction to an artist who fascinates us. In our view, the more open and complex the art dialogue and market are, the better... We believe everyone deserves art. While some gallerists and dealers may lament the rise of commissioned limited editions offered exclusively online, this phenomenon benefits both collectors and dealers in the long term. Greater opportunities to collect artwork means greater support and demand for these artists, and an overall more transparent and accessible art world. *In the interest of full-disclosure, I worked for Art & Advisory for a year.